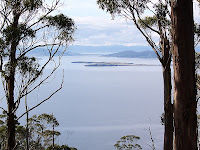 The other walk John Cannon wrote about in the Sunday Tasmanian was the walk along the crest of the Tinderbox Hills. This starts at the end of Estuary Drive, which is at the south end of Blackmans Bay. The track undulates quite gently along the ridge, offering good views to both North West Bay and the Derwent Estuary. This view is of Arm End across the river. There are a lot of tracks up here. My walk came to an end when I found the track firmly fenced shut and marked with a red rag. I backtracked and looked for another way, but didn't come across anything that looked likely. On looking at the map on the LIST once I got home, it seems the track I was on is the Mt Louis Road, and I should probably have kept going along it despite the fence. I didn't have a detailed map, as Service Tasmania seemed to have sold out of the Blackmans Bay 1:25:000 map when I went the other day. I think I'll just start printing maps out from the LIST or Google.